Long sleeved cardigan:41cm 3 balls, 46cm 4 balls, 51cm 5 balls, 56cm 6 balls, 61cm 7 balls, 66cm 8 balls. Short sleeved cardigan: 41-46cm 3 balls, 51-56cm 4 balls, 61cm 5 balls, 66cm 6 balls. 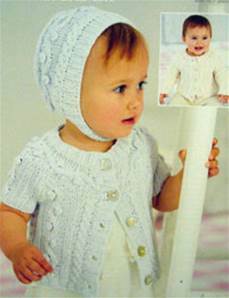 Bonnet (0-2yrs only): 2 balls. Based on 50g balls bamboo blend DK.